This week I cast on two projects destined to be store samples for the Hub Mills Factory Store. Hub Mills is the outlet store for Classic Elite, who published myKudzu and Drop Everything patterns via their free web-letter. I’m lucky enough to be their newest employee — I’ll be working two Saturdays a month, starting after Thanksgiving when the store opens in it’s new Billerica, MA, location. I’m so excited to be joining this group of talented knitters. (A major “thank you!” to my friend C who recommended me for the position!) In addition to helping staff the store, I’ll be teaching classes some Saturdays — more info to come! 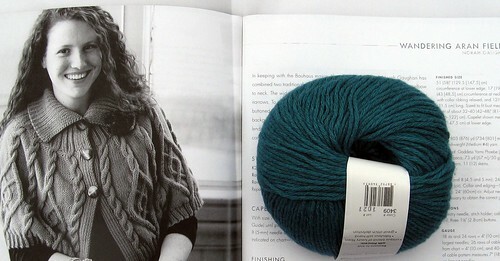 The first project is a cabled cape from Wrap Style: Wandering Aran Fields by Norah Gaughan. I’m using CEY Princess in Peacock. Princess is a great blended yarn — Wool, Rayon, Nylon, Cashmere, and Angora. It’s super soft, but has great stitch definition. I’ve cast on the 332 stitches for the larger size and I’m done with the ribbing. I found out after ten rows that I was 1 st off. Rather than re-do the ribbing, I spent three hours dropping down every other row and changing knits to purls and vice versa. It probably would have been faster to rip out and re-do, but I couldn’t face all that ribbing again! 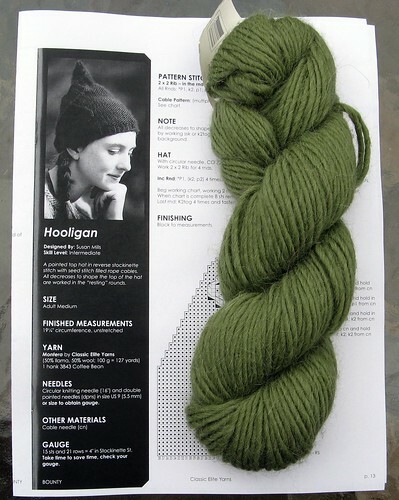 The second sample for the store is cabled hat from the Bounty pattern booklet: Hooligan by Susan Mills. I’m using CEY Montera in a beautiful olive green. This llama-wool blend is aran weight — perfect for a warm, cozy hat. I also cast on the latest “Notorious Sock Knitters” shipment — but we’re still in spoiler season for that, so I won’t post a photo just now. If you’re curious, you can click through to a photo for my Sept 2011 Sock Club Socks. Saw a pic of your “Monster Pants” on Pinterest and found your blog (took me a while…). Lovely patterns and I’m adding your blog to my list of “blogs I visit regularly”l thanks. Thanks! I’ve never heard of Pinterest — could you send me a link? First off, these patterns look wicked cool and I think they’ll look even better once they’re knitted up. Second off, I keep meaning to stop by the Hub Mills store as I go to UMass Lowell (and it’s only 5 minutes from campus), I can’t wait to go and see your stuff on display! Better make that trip soon! The Hub Mills Store is moving to Billerica — our last day at the Western Ave location is Saturday, Nov 12th. I just stopped by today, I’m so glad I did. I got some gorgeous sock yarn to use to knit holiday presents for my mom and grandmother, and I got some other stuff too… I couldn’t resist the Desert wool yarn at $1/hank…. Ooh, congrats on your scores!